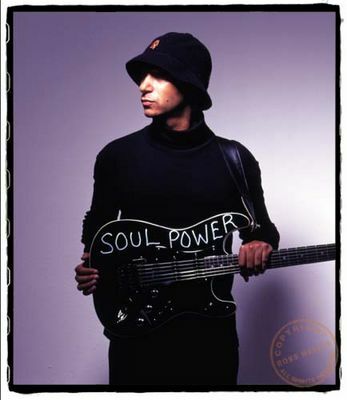 "Soul Power Guitar" – Fender Stratocaster, It has the words "Soul Power" on the top of the body in silver paint and is his main guitar in Audioslave for songs that are in standard E tuning. 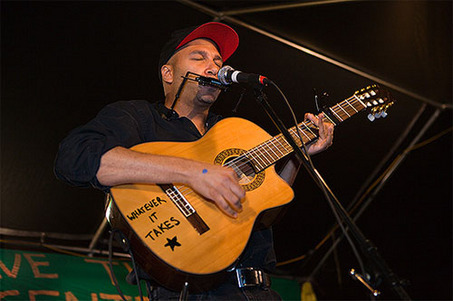 "Whatever It Takes Guitar"- A custom Ibanez Galvador nylon string acoustic guitar he uses during concerts as The Nightwatchman. 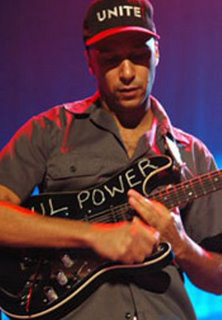 Plain body with 'Whatever It Takes ((star))' left of the bridge. 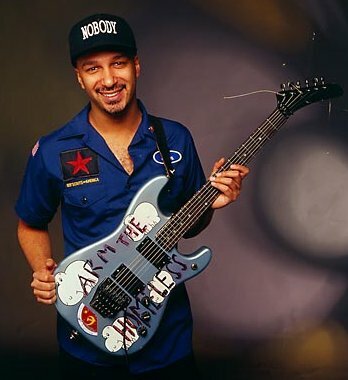 "Arm The Homeless Guitar" – Mongrel Custom and Morello's most famous guitar, and his main guitar for standard tuning since 1991. The body is blue with the words "Arm the Homeless" written on it in black and red. 4 Hippos (painted) on the front, one large hippo (upside down) painted on the back, and a hammer and sickle symbol sticker.